This friendly credit report service have a bundle of features in addition to their standard report and ratings, our team of experts have objectively reviewed the service and reported back the pros and cons. We are in no way associated with this company or any others listed on our page, but we have used the website as a customer and broken down some of the features that they have available. 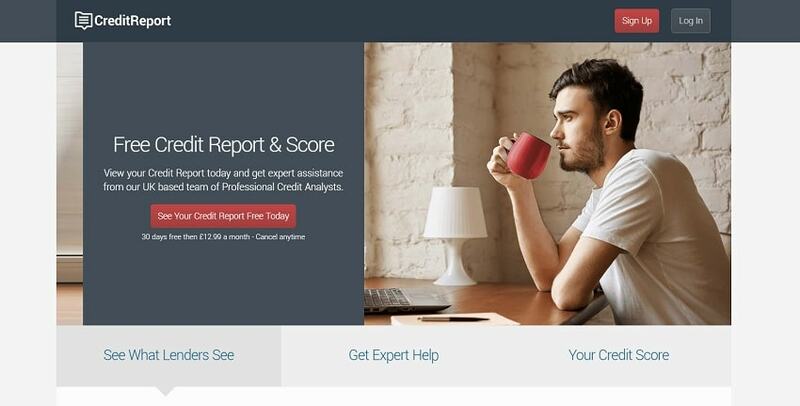 It’s great that in the modern era we have expert information at our fingertips, when you sign-up to CreditReport.co.uk you can enjoy a free credit score check, analytical tools, fraud assistance and a customer service on-hand to help you on your potential credit endeavours. Click to view your Credit Report and see why CreditReport.co.uk is such a popular site! This UK Credit Report website brings you exactly that- with an in-depth look at your credit rating. Upon registering you will be able to embrace a lot of information that comes your way and it’s all pretty easy to comprehend. These experts have been in the game a long time and after decades of experience in the sector they now put it to good practice with monitoring services, fraud deterrence and of course, ways to improve your credit score. Who are creditreport.co.uk? They began their journey in the industry all the way back in 1999 where they were the first company of this nature, there were no others available to offer online access to credit reports. Fast-forward to today and it’s common practice and almost a fundamental for those conscious about their score and chances of gaining a credit card, loan or mortgage. They do not sell customer data to third parties, have a secure system and also offer a free credit check, again, they were the first to offer this and continue to be ahead of the trailing pack with many of their financial solutions and credit monitoring. Another good brand to try out can be seen in our Scores Matter review as they offer a range of services too. Once you visit their domain you’ll see just how easy it is to signup and then login with just a few details required. You can capitalise on the fantastic free trial that includes all of their features and if you’re happy with the service you can keep it running for just £12.99. This is one of the cheaper programmes on the market and that’s down to a lack of data, in-fact they have some attributes that many others don’t. It only takes seconds and you don’t have to offer too much extensive information. Once you have completed this you will receive an e-mail of confirmation and can also log-in. Do this and enjoy their complete functionality without worrying about it taking too long or having to make big payments. Signing up is simple and we were also impressed with the great value offered online as they only charge £12.99 a month, a lot cheaper than their rivals who usually cost closer to £20. Alternatively, you may want to try out Experian free credit report, although they may not have the same benefits like with CreditReport.co.uk. Something that shouldn’t be overlooked and after utilising their service for this review, we managed to see how important it really is. They displayed tactics that we weren’t aware of and even have different identity protection software that could prove a god send for you. The majority of credit report sites have protection against fraud, as this is a very important thing to think about when putting in your details online. Make certain to check this out before signing up to any site and putting in your card details. There are certainly places they can improve- as they don’t showcase the social media image feature or other potential monitoring utilities, but they then offer the contrast in other areas with a complete full-circle service when it comes to identity protection and credit reports. You can get a full view of your report with plenty of options that enable you to look at each and every item. Enjoy a historic look that tracks your records that date back six years, it’s also possible to view other little details and items that all amass to create your score. The credit score service is second to none and has a lot of depth whilst the additional features also give you everything you need. Although they interact brilliantly and their customer rapport is that of the best, the actual dispute process is quite drawn out although this is usually the case at many companies as it takes a lot of detail and isn’t something that can be taken lightly. If you feel as though this might not be something you would want, you might want to check out our Experian Credit Expert review. Being the first online credit report company, they have a lot to live up to and in 2006 they also became the first website to offer this for free. This service continues and with other companies hot on their heels, it seems that they’ve surpassed their personal best and now offer not only an in-depth breakdown of your financial history and credit report that’s compiled via all the technological advances they have available but also identity protection features that are personally catered for you. Their fraud protection enables you to see where theft has occurred in the local area and ways that you can avoid it. They also examine historical data that they decipher and you will enjoy a complete breakdown. One of their biggest strengths is the fact that they brandish unlimited information and assistance, get hold of their fraud assistance team to prevent anybody stealing your identity. Their team contact you every time credit is taken out in your name meaning there’s no way of anybody sneaking past your firewall of approval. If you apply for a loan of financial aid but feel you’ve been wrongfully rejected then check the score that you received. Is it accurate? If you feel the credit score itself is inaccurate then you should get in contact with the lender, this isn’t something that should be half-heartedly looked at, you should check the score and if it doesn’t represent what you owe or how you score should look now or in the past six weeks, get in touch. If that fails you can easily contact the customer support at Credit Report and ask for their assistance. They can help you draw up an appeal and start to address why it may be inaccurate. Also have a look at our Check My File review to see another great service which we have used. This website is one of the easiest to use and it’s full to the brim with information, they have additional pages on credit reports, identity protection detail, interactive analysis and how you can look at for local identity theft. They’re on the ball and their communication ensures that you are too. You don’t need to be a computer whizz or a financial expert, they do all of this for you. Just sign up to their monthly service and they will be by your side to see you through the process. This is where they trump many other companies, with their attention to detail customer service that’s always on-hand to help you and your score. They can be contacted instantaneously and their fraud protection team will be in touch with you if there’s any reason for them to be. This is where they excel, so if your looking for a company that give you their undivided attention when need it, this is the credit report service for you! Cancellation is simple. All you need to do is call the company or send them an email and they will be able to sort it for you. Pioneers in this field – they started a lot of UK credit reports and were the first to bring it to the public for free. That’s why we have a soft spot for this business, but it’s not why we rate them so highly- that’s merely down to the complete professionalism and higher knowledge they have in this industry. They have extensive experience and a team that take it very seriously, although they lack in some aspects with no social media reports or other monitoring tools, they have hit the heights of others. You can enjoy fraud protection with a team that will be there specifically for you and they will call you if they see any suspicious behaviour, they actually notify you of anything taken out in your name. They get praise from us and this stands as one of our favourite credit report websites with everything you need and a great breakdown that tells you how they came to your credit score. Plus they actively help you improve this score and even have a plentiful guide to numerous information on their website. It is well worth trialling this service with the free 30 day trial and even their monthly service only comes to £12.99 a month, making it one of the cheapest on the market. Certainly worth a go and is one of the easiest online services to utilise. We would highly recommend CreditReport.co.uk if you are wanting to find out your credit score. The site offers so much information and data, it's great for everyone. Had an amazing experience with creditreport and received bonus codes and signup deals nicely from yourcreditreport. Don’t regret signing up to this site. Got everything I needed.